1. Dungeons and Dragons is about imagination. It is sitting at a table, with some books, paper and pencil (or their electronic equivalent, PDFs and spreadsheets), and using the power of your mind to throw yourself into a fantasy world. Everything that your characters do is something you decided for them to do. This is no video game designer laying out choices for you. In my 20-plus years of gaming, our characters have started wars, ended wars, rescued people, killed monsters, started towns, started criminal organizations, thrown parades, stopped parades, bought bars, built temples, in addition to countless other things. 2. Dungeons and Dragons is structure. No creative endeavor, be it art, music, writing or performance, can exist without a framework of rules and boundaries. Our English language is built on 26 letters and our music 12 notes. It is the creative person’s mission to build something in the context of that structure that is worthwhile and maybe even entertaining. 3. Dungeons and Dragons is social. You can’t play this game alone. It requires at least two people, and typically four to eight. Interacting with other people, especially face-to-face, is important. It just is. 4. Dungeons and Dragons is performance. In a game, you are always performing for other people. You’re very much an actor playing a character. And just like a performer, sometimes you fall flat on your face. No one laughs, or doesn’t find what you do believable. Any performing artist will tell you that, though this hurts, it’s made them better people. 5. Dungeons and Dragons is problem-solving. The dungeon master (DM), the individual who runs the game, is responsible for challenging the players. The DM must sit down and come up with problems that the players may or may not solve. Players find the problems and try to solve them. I don’t know what part of the brain this helps, but I’m sure it’s important for cognitive development. Or something. If you can think of more great reasons children should play D&D, share it in the comments! This entry was posted in Lifestyle and tagged dungeons and dragons, RPG, TSR by adam grimm. Bookmark the permalink. This probably fits between 2 and 5, but I think the planning aspect was a big part of D&D for me. That might be character creation or figuring out how to enter a room of hobgoblins. 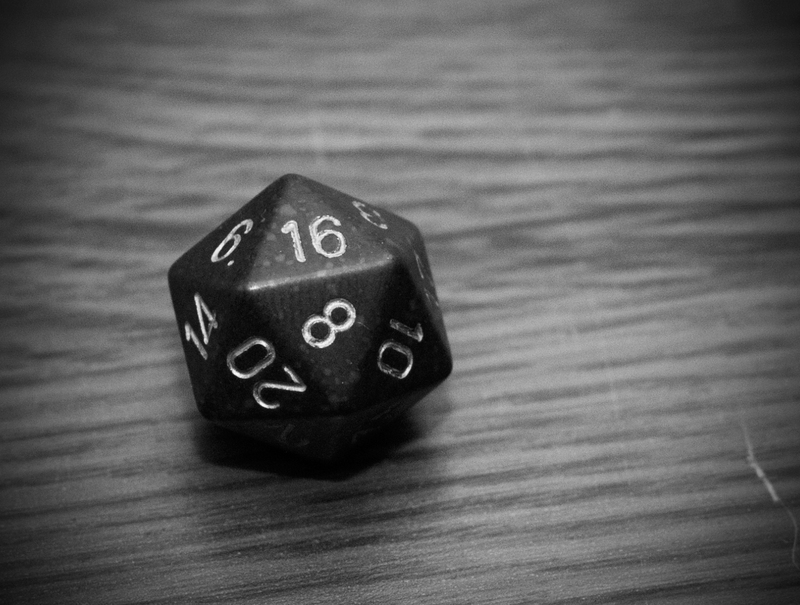 D&D was, for me at least, critical in developing an understanding of probability. Good arithmetic exercise, too, and agreed with Kevin on the planning aspect. No creative endeavor, be it art, music, writing or performance, can exist with a framework of rules and boundaries. No creative endeavor, be it art, music, writing or performance, can exist *without* a framework of rules and boundaries. The most important part…above all, you have fun while playing. So, why not any other RPG? I’m not OP but I think in this case D&D is just being used as an example. As long as it’s a group-based tabletop rpg then these reasons would work for that too. That’s simple. It’s the most well-known. My 3 year old son knows I play (now a monthly all day event) with 3 other friends. He knows I knows I play Lord of the Rings Online and sorta kinda understands a litle of what’s going on for the few minutes I let him sit on my lap after logging in and doing trips to amuse him. He’s asked about when he gets to play these games. LotRO… much older, but I told him we can try to create an adventure that he can roll some dice for and create a story with me. He was very happy to hear that. D&D is my pen and paper (well, laptop character sheets mostly now) and dice game since 1983… I think I came out kinda sorta normal. OK, maybe not, but I’m not a bad guy. D&D has a large amount of information to get his head around at that young an age, but I suppose you could either play an RPG with more simple rules (some have a way to build characters just by asking simple questions) to build the way up to the harder ones. Or let him sit in but not play on a few sessions then when you think he’s ready encourage him to join in. try tristat for a young kid it can be very simple and you can scale the complexity as he ages. the core rulebook is free online. Even some of us in our 40s prefer classic “Basic” D&D over AD&D or Wizards of the Coast’s incarnations. I think it’s great your son wants to play, I started playing when I was 5 because my babysitter was setting up an adventure at our house. I love it. It helps children become more accustomed to doing math in their head, and gets them more comfortable with it. How about teaching the kids( and adults ) math, reading, decision making? My 11 yr old has played with my husband and I for 5 yrs… Of course gearing some of it down but still making in a challenge! But most of all it’s about having fun and making sure you check for traps! Reading is what I was going to add as well. My friend’s son used to sit around and what us all play as he was growing up. He kept asking his Dad when he could play. He was struggling with reading in school and rally didn’t like it at all. His Dad told him when he could read the D&D books he could play. That was all it took. He worked hard and stated getting better. As he work his Dad started running games for him and his friends. Also, trying to navigate sticky situations. Kids are always presented life in a “wrong choice/right choice” dynamic in their media. When I create D&D adventures with my kids I can put them into situations where maybe there is no clear “right” or “wrong” choice and they have to think and stretch their brains and figure out what the ‘best wrong choice’ might be. It helps them to encounter the world with a new way of sussing out what they should do. I was a DM for years. I loved it. I hope my daughter plays some day (though at 3, she’s a little young yet). The time spent with friends, figuring out ways to stump them, and watching them in turn try to tick me off with their characters was priceless. Even though my husband and I don’t currently play, there is still much love for paper and dice gaming in our household. D&D (and any other P&P RPG for that matter) allows the players to “test drive” different versions of themselves. As a nice and (somewhat) non-violent person, I prefer to either GM or play very bad people. The fantasy world allows me to experience what it is like to be a villain…its not all shining knights and distressed maidens let me tell you! All reasons I taught my two oldest to play D&D and why the oldest plays with his friends. I incorporated D&D into our home school curriculum because it teaches basic math and problem solving skills, as well as teamwork, which has been hard to get my 3 kids to grasp otherwise. I was going to say teamwork too. I mean sure, you have people who try to screw over everyone, but those games where the majority are doing that never get anywhere. It can also provide a sense of actions and consequences in a safe setting. Sure, you -can- steal from other players, but then they find out and leave you on a tiny island that they’re passing..
D&D is great practice for learning to deal with jerks who have control of things you need (e.g. other players, not NPCs). This will come in handy once they enter the working world and have to deal with their management chain, coworkers, and other departments of the company. Critical thinking, I’d play with my children to give them a timed response to a critical situation for them to learn from. It’s not just about imagination folks! It’s about educating them too! All in all, it teaches them maths, creative thinking, and critical problem solving skills that schools don’t cover in a great deal of ways. Don’t forget vocabulary skills. Kids who play D&D expand their vocabulary and comprehension skills by using the rule books and supplements. When my husband was 9 years old, he was correctly using words like constitution and dexterity in non-gaming conversations. Empathy! DnD makes you take the part, the position of someone else and teaches you how to see things from more than just one angle. It teaches great math skills, when you’re trying to calculate damage, hit points, armor and other bonuses, etc. You forgot one of the most important things. It teaches you math skills. It’s not just basic addition and subtraction. Some situations call for multiplication and division. Every time you roll the dice you are dealing with probability. Also, let us remember the reading, and comprehension skills it teachers. All of these are very excellent reasons, but with my sister and I (we got our first books at the ages of 10 and 8, respectively) we learned bargaining skills, debate skills, conversational skills, and overall proficiency (see what I did there?) in winning other people to our cause. Maths are learned. Spelling. English. Geography if you play a real world RPG. Science. Its endlessly superior to and other learning tool . I haven’t played DnD yet with my 10YO, but I’ve played Call of Cthulhu, Star Wars D6 and Microlite20 with him! I’m due to run a follow up CoC with him tomorrow. I’m hoping it’ll teach him problem-solving and mathematical skills while having fun. Role playing. I couldn’t write my novels without it. Resource Management…and its damned fun! Prevents teen pregnancy through abstinence! My favorite aspect of RPGs has always been the constant need to improvise and adapt. Some GMs give you a lot of detail about the fictional world and some give you less; some GMs give you a lot of flexibility in how you can interact with that world and some give you less; some game systems permit your character a wide range of options for behavior and others lock you into certain patterns; but in all cases the player has to find a balance between available resources and how they can be used to achieve the character’s goals. The best games I’ve played in were the ones that “wanted” me to flesh out and interact with the fictional world’s details, and then allowed me to reap the benefits or suffer the consequences of that imagining. The best games aren’t the ones which require you to ride the rails from the beginning to the end of the plot, but rather are the ones that shove you off a hill and roll right along with you to the bottom. Speaking of AD&D. I’m running a 2nd Edition Skype Game Wednesday Nights at 8pm Eastern. Some modifications to the rules are: No level limits for non-humans, ALL fighters can weapon specialize, I have some rules about dual wield that are slightly different than 2nd edition. All classes are avialable including shaman and chronomancer. I will entertain other classes from more arcane references on a case by case basis. Spinoff skills. When my family lived in Chicago, the party had an airship, in a magical world where airships have wooden hulls and sail through the sky. The teens in the group got interested enough in sailing that we formed our own ship (equivalent to a troop) of the Sea Scouts, chartered with the local Council, got a sailboat issued to us, and spent weekends out on Lake Michigan. The council started sending us other kids who were interested in sailing, and the ship grew. My family has since moved to Virginia, but last I heard, the Scout ship was still active. D&D has kept me away from a life of drugs and street crime. Except for when I’m a rogue and I engage in drugs and street crime. My only problem with your list here is that you only consider D&D. There are many tabletop games that fit here, so don’t limit it to just one branded product. How could someone without any connection to D&D get started? Find a game store in your area and go talk to the people that work and frequent there. Sometimes they will have a bulletin board where people can put up a note looking for other players. Also try searching online. There a sites that list players and sites like Craigslist might have people looking for players. I would also suggest downloading a free copy of Labyrinth Lord, Basic Fantasy RPG, or Swords & Wizardry. These are free games that closely emulate classic (and out-of-print) D&D. Then invite some friends to try it out with you. Oh, and check out Constantcon. People are playing D&D (and other games) online everyday through G+ hangouts, and newcomers are always welcome. D&D and AD&D and other RPG’s access the right portion of the brain, teaching the aspects of imagination/fantasy. What RPG’s do as well is that they allow you to excape, submerse yourself in another life away from whatever struggles or situations you find yourself into. By accesing the right side of your brain on a more consistant basis, one will find themself easer to talk to and meet new people as well as being able to step back from certain situations and take a third person point of veiw. The most important thing I learned from D&D was that Wisdom and Intelligence are completely unrelated attributes. LOL, Now that’s gold! And oh so true. D & D is about possibility. Video games are about figuring out the algorithm. One: my husband plays and has since freshman year of college. With the same group of friends! It seems that lifelong friendships are often built around D&D. Two: my husband learned computer programming for the sole purpose of creating databases and name generators for D&D. This led to a career in programming that supports our family very well indeed. In my teens I ridiculed the game. As an adult, I can appreciate it for the wondrous organic multilayered thing it is – it is rife with possibility! That’s all well and good but what of you can’t find a group to play with? I smell a web project for someone. Well as I said above there are already places for this. One example is http://www.penandpapergames.com where you can go and list yourself with gaming likes and experience as well as what you are looking for. If you play or want to play Pathfinder (a new “version” of the D&D 3.5 rules) then you could just go here http://paizo.com/paizo/messageboards and post a message saying you’re looking for a group. Then there’s Craigslist as I mentioned before. Plus you could simply do a Google search for your town and the game your interested in. But most importantly your local gaming store would be the best place to start. The best result that can come out of this or any other role playing game is during the summer vacation, kids can get off the idiot box and keep their brains active. As you stated, you have to use your brain for imagination, to read, to solve problems, etc, etc….There is math, reading, history, creative writing to name just a few subjects. Best way to prevent summer brain drain. About a year ago my daughters (ages 7 and 9 then) asked if they could join our Saturday group. We talked it over and let them join in as a pair of Kender that they freed. Needless to say, a year later and 8 levels higher, they are having the most fun and have learned to do most math quickly in their heads. What campaing are we running? The worlds largest dungeon.. I spend an hour each night filing each new level for the next week. I also tease them terribly by looking at the Tarrasque and Dragon pages in the monster manuals.. I used to play D&D as a teenager (don’t have time now), and would recommend it to anyone. I was the Dungeon Master (control nut even then :), and was obsessed with running the best games I could for my players. My ‘world’ was set on an island, but to ensure its believability I researched: geology to give the island an appropriate shape and rock makeup; meteorology to give it plausible weather patterns; economics to give it an appropriate infrastructure; history to plan events that took place; and a whole bunch of other stuff to create a fully immersive world. Like doing homework without actually doing homework. Learned so much that must have shaped future academic interests, as well as a capacity to source information, study it, and derive appropriate conclusions. Totally worth playing IMHO. I wonder ifyou might like playing if it was once a week, old school AD&D 2nd edition? I’m running a 2nd Edition Skype Game Wednesday Nights at 8pm Eastern. It always seemed to me that D&D, or RPGs in general, were so wonderful at developing our capabilities broadly speaking because they require a sort of synthesizing of a wide array of mental skills and cognitive styles: writing, memory, maths, speaking, emotions, vocabulary, narrative, wit, consequences, ethics, compromise, cultures and their Myths, etc. You might be good at two and bad at the rest or vice versa, but for me D&D certainly improved them all IN CONCERT with the others. So, Terry Pratchett’s insightful quote, “Fantasy is an exercise bicycle for the mind. It might not take you anywhere, but it tones up the muscles that can. Of course, I could be wrong.” seems to apply well to such games as well. Theses games are expressly forbidden if your a Christian. If you don’t care, well have at it. Ah yes, Christians, can’t forget about them. Can’t have a discussion about D&D without hearing from them. Why is it exactly that Christians are expressly forbidden from playing these games? Because they know nothing about what these games are. They think that because there is a book in this game called the Monster Manual and it has demons in it we must all be demon worshipers. It doesn’t matter that these games have absolutely nothing to do with that, as I think the above comments have shown. The bible talks of demons and devils, does that make Christians devil worshipers? Of course not. But they have made up their collective mind that they know the truth without every actually researching it. It’s sad really. What about all the games out there of different genres? You did know that there are other genres of these games didn’t you? Games that don’t have any monster manual types books with demons in them? Games like Travellers and Star Wars (yes there is an RPG based on the movies), sci-fi games based in the far future. Or Spycraft or Top Secret where the characters are like James Bond. No demons there. Games like Champions where you play superheroes or Gamma World where you play in a post apocalyptic world. There are games for all genres out there and they are all just that… games. Nothing more. No different that poker or tic-tac-toe. They are enjoyable, educational games that everyone can play and learn from. As others have said, they can learn history, math, grammar, decision making and problem solving skills. They can improve their social and communication skills, their writing and memory skills. They can build life long friendships and learn tolerance and understanding. I feel sorry for those Christians out there that know nothing about the game and lose out on playing a fun game with their friends simply because they refuse to try and actually understand it. I feel sorry for those Christians out there that know nothing about the game and lose out on playing a fun game with their friends simply because they refuse to try and actually understand it. This post came up on my Google Plus page, so that is why I responded to it. The post came up in my Christian circle so I posted back. People usually post something expecting to get responses or they would not posts them or they would disable responses. People who post in public can expect replies. I was born and raised Christian. My father was a Lutheran pastor. I grew up playing D&D and you know what happened? I learned a lot about myself, about how I fit in within this world, and how to socially interact with others in a positive way. Surprise, Surprise, my life is actually wonderful. I have a great career, a wonderful family, and guess what else….None of us worship the devil. So for all of you out there, christian or otherwise that bash on role playing games (D&D in particular), stop being so close minded. If you really took some time to talk to people and listen to what they say, you would find so many that have or still do, play RPGs and they are wonderful people. Not only that, but I’m willing to bet that out of everyone in history that has or is playing RPGs, there are very few that it affected in a negative fashion. Unfortunately, those few are the ones that everyone publicly hears about, when they go on a killing spree and then blame D&D for “making” them do it. But do you what…….If they didn’t have an RPG to blame, they would have blamed in on Rock n’ Roll, or Rap music, or there neighbor who always gives them dirty looks, etc, because they can’t take responsibility for their own actions. Anyway, D&D, which I still play and my kids are starting to play with me, has helped me to learn many of the skills that have already been mentioned and I know that it will help my children learn them as well, because when you’re having fun learning you LOVE learning. I was introduced to Basic D&D at Sunday school at our Episcopal church… I guess they aren’t Christian huh? Please show me where God says Roleplaying games are forbidden. Yeah, I ran the D&D game at our church and they gave me a certificate of appreciation. It’s funny, if you look at the cleric spells, it’s right out of the Bible, stuff like heal the sick, feed the hungry, raise the dead, part the red sea, sticks to snakes, etc. I even read/heard once that some CHRISTIAN publishing company made their own game that was like D&D but even more explicitly pro-good and Christian-oriented than D&D – and they were run out of business by their fellow “Christians” persecuting them for promoting such a “Satanic” (?) game! Great stuff. Try it with your kids sometime. Math and reading skills as well logic and reasoning for my kids as they roll up characters or take their turns DMing. Overall D&D promotes teamwork, discipline, character, thinking fast on your feet, intelligence, imagination, etc. and it’s fun. It exercises both the rational and imaginative halves of your brain together and makes a wonderful break on weekends – I wouldn’t be surprised if some study was made and showed that long term playing of games like D&D helps to slow or prevent cognitive decline, dementia, Alzheimer’s, etc. Good reason to play D & D or other table top role-playing: family bonding! When my husband and I get together with our friends once every month or two to play we have very enthusiastic participation from our 22 year old, 17 year old, and 11 year old. Of course, we can and do have outdoor fun with things like hiking and boating, but this is the only indoor, thinking activity I know that makes a teenager actively want to spend a long day with their parents! Interaction with other human being is what D&D brings to the table (pun intended), IMHO. Math can be learned in school, politics will sink in through osmosis, but interaction is king in D&D. Dealing with power gamers and rules lawyers, listening to your players as a DM are some of the social skills and bonds you get when you play, skills that are waning even in the public school system (as school just seem to make kids meaner and more jaded, rather than more cooperative). RPGs is just one of many ways a kid can learn to get along with others, but I like it better than other methods becuase 1) I know how to do it and 2) it can be a very cheap hobby, if your careful with it. Just started playing last weekend and I am hooked. I have a D&D hangover at work and can’t wait for the weekend. When the players begin morphing into their characters and start breaking stuff (for real), it’s just awesome! The personalities this game can bring together are amazing – managers, supervisors, developers, designers, we even have a drummer of a rock band. DnD has changed my life over the years. I went from being sighted to being totally blind. I love to come up with wicked DM plots and run them. And yes, I am a female DM. Smiles. Children can learn oral storytelling and quick thinking from DnD as well as teamwork and uncommon kindness. I hope that you all are having fun in your lives and your games. Has anyone mentioned reading comprehension? I read through, but don’t recall it being mentioned . . . Oh, that reminds me – sense of humor! Every gaming group has moments when they just go off on a goofball tangent and just laugh ’til they cry. I’d post an example, but they are almost always ‘inside jokes’, which is even better for bonding with your buds.